Android users that also create documents using Microsoft’s various Office applications might be interested to learn that they knew that date has been released this week for Microsoft’s OneNote for Android application. The new OneNote for Android update brings with it a number of new features and enhancements together with handwriting support, enabling you to quickly jot down your thoughts or notes using the stylus on your Android tablet or smart phone. OneNote for Android Enables you to write down notes, record audio or snap a picture and save them for future reference in Microsoft’s cloud storage service. The newly updated OneNote application requires that devices are running Google’s Android 4.1 operating system or above. Once saved your notes sync across all your devices allowing you to easily access them whenever needed and share them with your colleagues or friends. 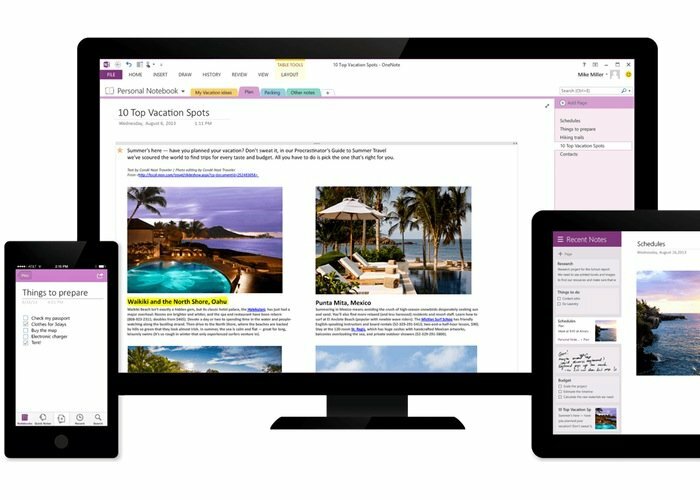 Microsoft has also made their OneNote apps available for PC, Mac, Windows Phone, and iOS devices. – Create and update notes and checklists. – Bold, italicize, underline, highlight, indent – format notes like you do on a computer. – Organize your notes using notebooks, sections and tags. – Take handwritten notes or add handwriting and drawings to notes. – Your notebooks sync across your computers and devices. – View notes you created on your computer, including formatting, video, and attached files. – Search your notes and files for anything you’ve captured – even text inside pictures. – Home screen widgets let you quickly create picture, audio and text notes without opening the app. – Get to your most recent notes right from your Home screen with the OneNote Recent widget. – Add your favorite page, section, or notebook to the Home screen for quick access. – Access your work notes stored on SharePoint Online sites from your tablet or phone. – Capture and format notes for classwork, meetings, or research. – Take handwritten notes during lectures and have them available everywhere. – Add audio and video to your notes. – Snap a picture of the whiteboard and add it to your meeting notes. – Share a shopping list with the family and mark items off when you’re in the store. – Create an itinerary and keep track of your travel plans for your next big vacation. – Take pictures of receipts and bills to get rid of paper clutter. – Collaborate and share ideas with your team. – Research products and prices to make the best purchasing decision.